Getting to The Gili Islands is super simple; Either fast ferry it or fly. 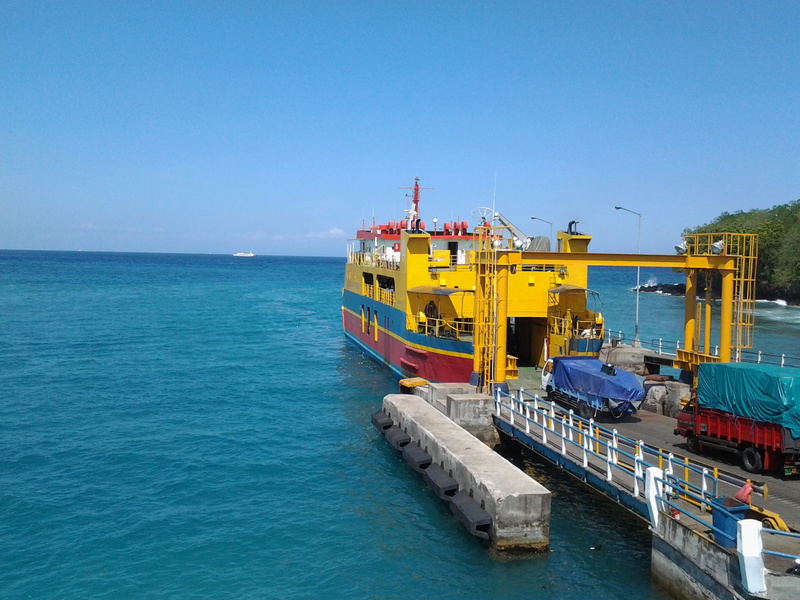 And if on a budget you can also take the big car ferry from Padangbai (Bali) to Lembar (south west Lombok). The most common way to get to The Gilis from Bali or Nusa Lembongan is by Fast Boat. 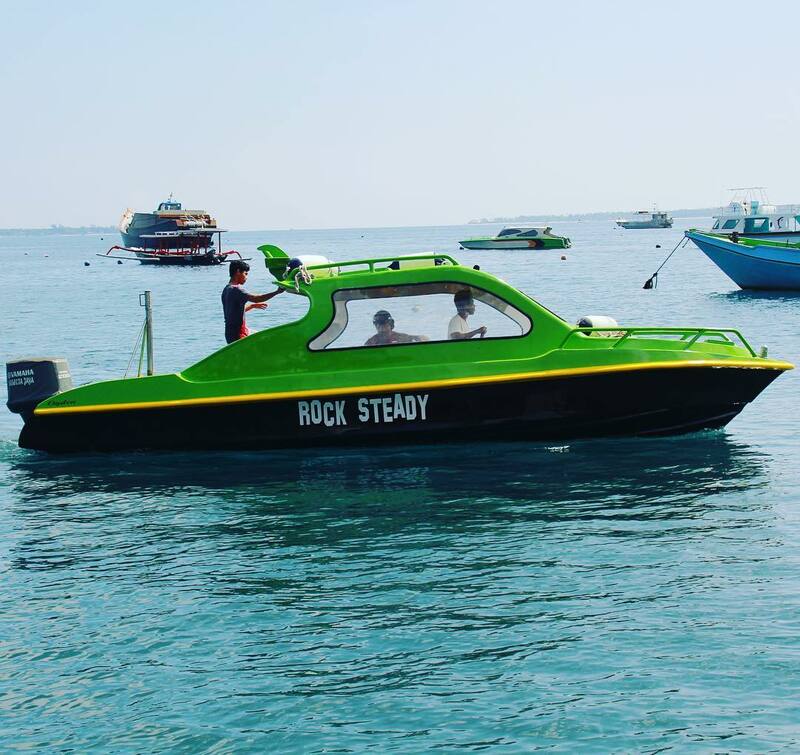 There are a huge range of Fast Boat companies all of which can be booked online or through your Bali accommodation. A driver will pick you up from your hotel then drop you at one of the five main fast boat ports; Padang Bai, Benoa Harbor, Serangan, Sanur or Amed. Insider Info: We highly recommend Ekajaya, a really comfortable fast ferry with air con and movies to entertain you on the way. Please note that most fast boats go to Gili Trawangan and Gili Air, only stop at Gili Meno if there are many travelers headed there. 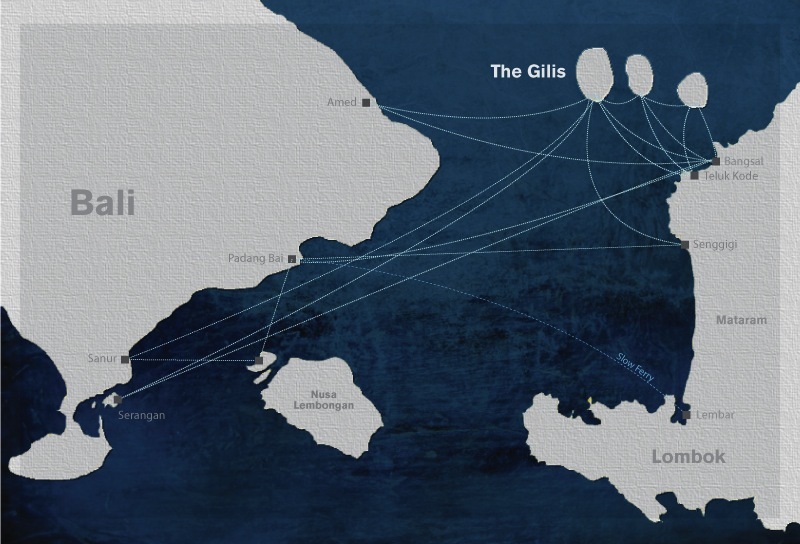 Should you want to make your way to Gili Meno make sure that your boat will stop there. Otherwise there are several public and private boat operator available on Gili T and Gili Air at the harbor. Flights from Bali (DPS) into Praya, Lombok (LOP) take around 30minutes and are usually reasonably priced. You can then organise an airport pickup and boat transfer package deal to the Gili Islands. Make your way by car to Bangsal (public boat harbor), Teluk Kode or Teluk Nara (private speed boat harbor) where a boat transfer will be waiting to take you to The Gilis. 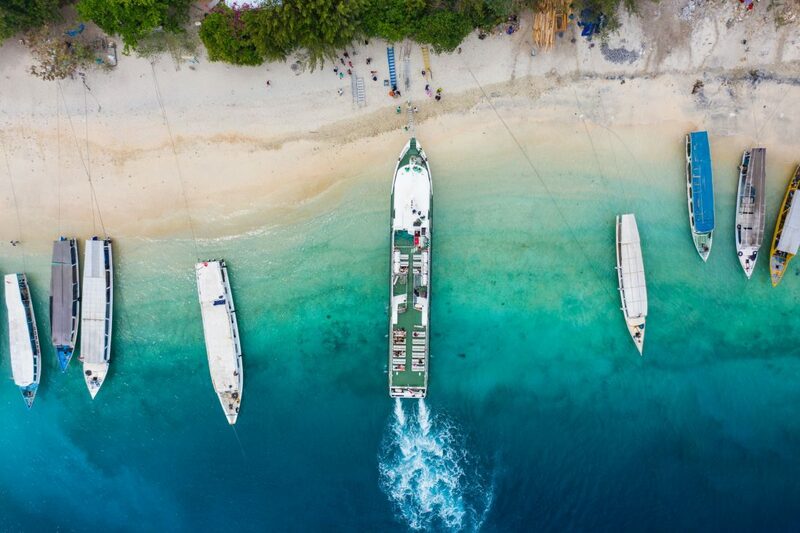 Flying straight to Lombok has the advantage that you can get to the Gili islands straight away and you don’t need to rely on the fast boat schedule / connection between Bali and the Gilis. Want to arrive in style? Getting to Gili Islands in a Bell 206 Long Ranger Helicopter with Air Bali will definitely make heads turn. Enjoy a direct 45 minute scenic flight over Mt Agung, Lembongan Island & Mt Rinjani en route. Transfers to and from Gili Trawangan to Benoa are available on daily basis. If you are on a tight budget, there is a public ferry that departs from Padang Bai, Bali and arrives at the port of Lembar, 22km south of Mataram, Lombok. The ferry takes 4-5 hours and leaves every 90 minutes or so, 24 hours a day. Once you are in Lembar take local transport via Mataram to Bangsal, where the local boats leave to the Gilis. Many travel agents in Bali will be able to help you with booking transport from your hotel in Bali to Padang Bai, the ferry ticket and transportation from Lembar to the Gilis. 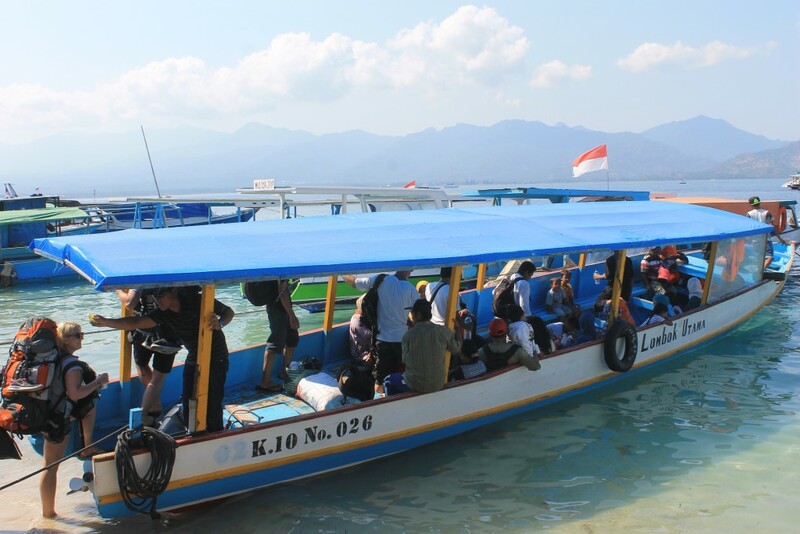 From Lembar you have to take local transport to Bangsal from There you can take a public or chartered boat to either Gili Trawangan, Gili Meno or Gili Air. The fastes and most comfortabkle way to get to the Gili Islands from Lombok is by chartered speedboat from Bangsal. Boats leave 24/7 to all islands. For example with Rocksteady Speed Boat. Bangsal, in the nort west of Lombok, is the closest harbor to the Gilis. Public boats to Gili Trawangan and Meno leave from the beach on the left of the pier and boats to Gili Air leave from the beach on the right side of the pier. Make sure that you buy your tickets at the official ticket office. The office for Gili T and Meno is on the left side of the pier and the office for Gili Air is on the right side. Public boats run from 7am till around 5pm. The boats leave once they are full, minimum 40 people. The best chances of getting a boat quickly without waiting for hours are in the morning and afternoon. If you want to speed up the departure you can also purchase the remaining seats up to 40, which is a common practice between locals and foreigners who got tired of waiting. Or you can chartering your own boat which will leave immediately.